Abstract—Cisadane watersheds is a very valuable strategic area for the people in Tangerang District, Banten, Indonesia. But that strategic value has brings an impact in the form of water pollution, that comes from its popullation and economic activities. This water pollution load is necessary to know its source, and also how much, so that public, private and local governments can jointly take action to restore the water quality of the Cidasane River. The purpose of this study is to determine the pollution load in the Cidasane watersheds. The study will taking sample of Cisadane River water as an inputs in the isoyet map pollution dispersion modeling. And calculating the load in the river using QUAL2Kw modelling. The results of the modeling are then analyzed to obtain the amount of Cisadane River pollutant load. The pollution load in this study will be focused on BOD, NO3, and Total P, and Salinity. This research has shown the inter-regional pollution spread on the Cisadane river, which used This study will provide a measurable data of the type and scale of the pollution load in Cisadane, as an input for Cisadane River water quality restoration policy making by the Government of Tangerang. Index Terms—Cisadane river, Isoyet map, pollution load, QUAL2Kw model, sustainable watersheds. The authors are with the Universitas Indonesia, Jakarta, Indonesia (e-mail: adipatirahmat@gmail.com, takdir65@gmail.com, hendragupta@gmail.com, darul.syahdanul@gmail.com, danielmambo131293@gmail.com). 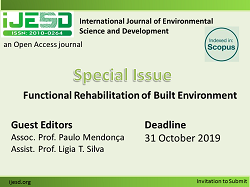 Cite: Adipati Rahmat Gumelar, Abimanyu Takdir Alamsyah, Ida Bagus Hendra Gupta, Darul Syahdanul, and Daniel Mambo Tampi, "Sustainable Watersheds: Assessing the Source and Load of Cisadane River Pollution," International Journal of Environmental Science and Development vol. 8, no. 7, pp. 484-488, 2017.